Domestic helpers, or “yayas“, as they’re fondly called, are a significant driving force in Philippine society. They aid in taking care of the household, and many times serve as second parents to the children they take care of. 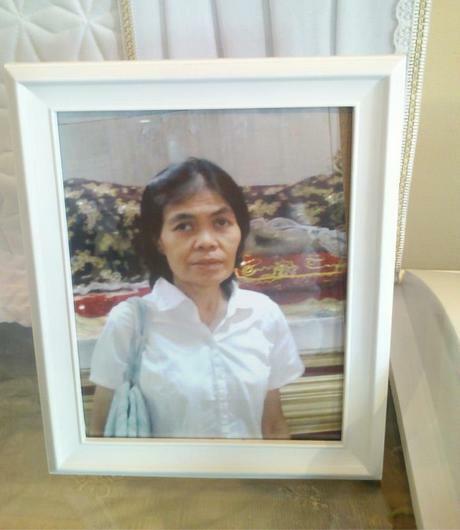 My yaya of nearly 30 years succumbed to ovarian cancer in February 2013. I’d like to share with you my last moments with her. The experience really struck me, and reinforced a lot of my beliefs on what constitutes a meaningful life. I’ll be giving you some things to think about at the end of the post which will hopefully help you reflect on your personal value in the lives of others. So without further ado, jump back in time with me and let’s relive one of the most significant moments that have shaped my life. “Feb 7, 2013, 11:30 am. 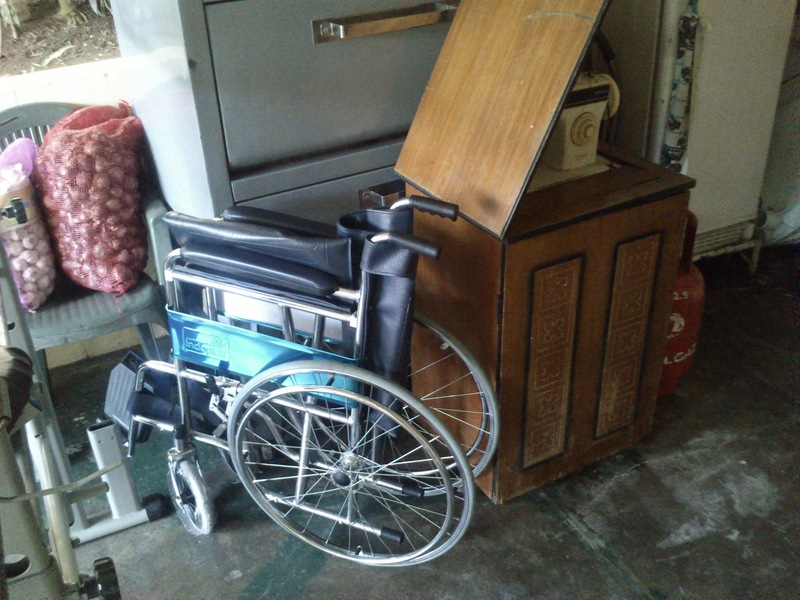 Her wheelchair in her last days. Today may have been the last time I ever see our yaya of 27 years. I’ve come to terms with that. What’s more important to me is that she can pass knowing that I love her dearly. At around 9:00AM today, I heard my parents and their secretary Cristine talking. One of them had just gotten off the phone. Mom told me, “The end is near”. I didn’t want to hear a further elaboration. I said something along the lines of “I understand”, and continued to get ready for my 10:00am class in UP. I asked what time we could visit and she determined later in the afternoon. And then I decided to just cut my class and go to the office instead (I was a working student), which was a 10 minute walking distance from the house. I had a gut feeling I would need to be nearby, even if visiting hours in Philippine General Hospital were at 4pm. When I got to the office, I asked Tita Vicky, one of the office admin, if I could get off at 3pm. She said, “Of course. What happened?”. I tried to stay composed, and explain, but no. I broke down. I tried to contain it, but couldn’t. Really, I was sobbing like a little girl from there until I got to my cubicle. I then decided to finish a document on my Evernote that I was dreading to finish and putting off for a long time: My farewell letter to my beloved Yaya. I finished it, sent it to my parents to print, along with a recent family picture, in case “anything would come up”. I told them I’d go home to sign it before we’d visit her in PGH. At 11:30AM mom informed me that Yaya Nelia would be passing by the house at lunch before transferring to Makati Hospital instead. I told her I’d go home right away. I couldn’t be more thankful that I decided to miss my class. Best time to cut, ever. At 11:55, I was walking home, one street away from our house, and my sister was calling, sobbing while she spoke. “Where are you? Please come. Yaya is here – she is too weak already, she can’t even get out of the car. After she sees you she’ll be brought to the hospital”. I ran. I will never forget that run. I dashed to the Strada and opened the car door, and hugged and kissed her. “Mahal kita ya (I love you)”. “thankk you… aldoo.. i…” was all she could muster. I then looked at her, and by all human standards she looked terrible. Pale, spotted, literally skin and bones. She was so weak so could barely move. To look at me she could hardly even turn her head. Only her eyes acknowledged my presence. The rest of her body was slumped on her relatives beside her. My letter was rested on a pillow nearby. “Nabasa n’yo na po ang letter ko? (Were you able to read my letter?) ” I asked. “..hiindii paa (not yet)” she said, even weaker. “Basahin n’yo po ah, please? Sana mababasa mo pa s-…(Please read it when you can. I hope you’ll still be able to re-..)” my voice trailed. She gave a semblance of a nod and I signed my letter. I held her dangling hand and told her, “Ya, mahal na mahal kita (Ya, I love you so, so much)”. I kissed her again and slowly closed the door. As I did so, I could slowly make out her eyes on me, her mouth in a tired open smile, and her tired dangling hand moving ever so slightly in a semblance of a wave. I’d later find out the the clot had reached her lungs, among other things. As conventionally traumatizing as the sight of my beloved yaya probably was, What I remember the most vividly are the last few seconds. Her perpetually kind eyes, her smile, her wave. In the last seconds before I closed the door and she left, I was moved with a strange happiness. I couldn’t help but remember my enduring paradigm that we must feel more sorry for the corrupted living, and rejoice in those who pass on but lived loving lives. I’ve heard that your sickness is getting worse, and that you are in a lot of pain. I know I try not to show it, but I have been very sad, and I think about you every day. I’m writing you this letter because I want you to always remember how thankful I am to have you in my life, and that you are very special to me. You have seen me grow from a little baby who carried his pink pillow wherever he went, to a young theater child whose costumes you made, to a weak skinny boy who needed your oatmeal shakes to gain weight and confidence, to a military man whose uniform you prepared so excellently, to a young aspiring architect with a dream to build bamboo houses for the poor (whose drafting materials you always kept organized). We both know I that I still sleep with my pink pillow. You’ve sacrificed so much of your life just so kuya (older brother), Alden, ate (older sister) and I could live more of our lives. You have spent countless hours washing our clothes, cleaning our rooms, doing errands, driving us around, accepting all our hassle requests, and cooking our food -while we did our homework, watched TV, played and grew up enjoying life. After nights you would need to stay up late because of something we ask, you would still wake up at 430 to prepare our breakfast and clothes for school. Sometimes you would be wrongfully blamed for our mistakes, and we would always feel bad about that. With everything you did, we always felt your love. We are so lucky to have such an honest, caring, and faithful yaya. The way you have spent nearly 30 years taking care of us and your sacrifices will forever be an inspiration to me. Ya, I promise you that I will live my life helping as many people as I can. All my successes in my life, you were a big part of. I want to continue living my life in the example of Mommy, Daddy, you, Nanay Deling (our cook of more than 30 years), Yaya Nila (our other yaya of nearly 30 years), and all those who have sacrificed so much for us. Pangako ko ‘yan (that’s a promise). At the end of your life, whenever that may be, just know that there are four young Mayoralgo kids who will do a lot of good in this world and help a lot of people because of you. We will be your legacy. I hope you can rest well knowing that. I remember something Mommy told me over a year ago. “Yaya Nelia gave us the best years of her life to take care of all of you. We should always remember to give back”. Your ovarian cancer hit your ovaries that never bore children. We will always be your children. I received a text from my sister. I was able to confirm that she was able to read the letter while waiting at the emergency room. It was the last piece of paper she would ever read in her life. In knowing that one of the last thoughts in her head before she died was that we loved her, I am happy. The last picture (albeit warped) that she would ever see. 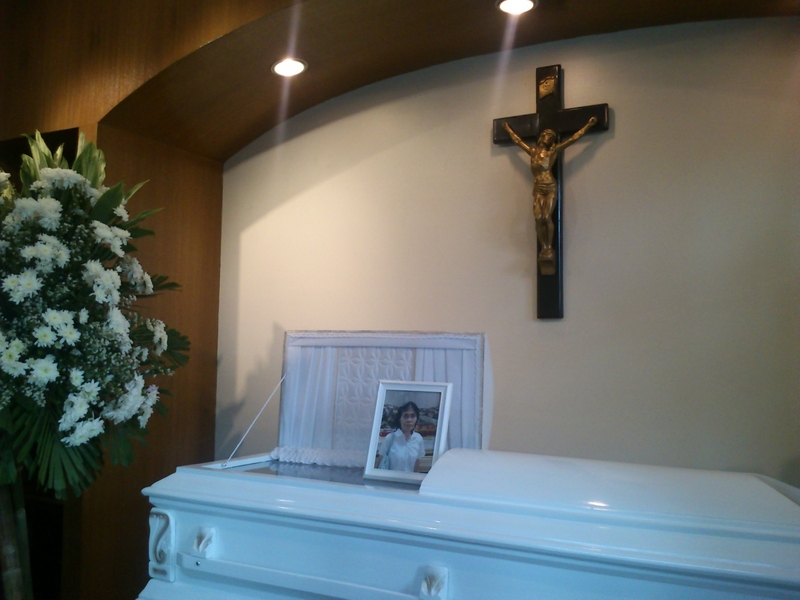 After reading it, she looked at her cousin, said weakly “Sabihin mo sa kanila… marami pong salamat.. sa lahat (please tell them, thank you so much… for everything)”. She was looking at the family picture I printed out and attached to my letter, where we all smiled at this wonderful, beautiful person who gave us her life. She would read my last message for her, and then enter the room where she’d cross over to the other realm. Life is fleeting, and sometimes we fail to realize what is truly important, or we get caught up in the small problems and inconveniences. We’re all human, and we’re all bound to get preoccupied with our daily trials. But we can choose to remind ourselves that life is so much greater than the strains and emotions of our youth. The year she died was my thesis year, and I decided to do a school for domestic workers as my thesis topic. People told me from the get-go that it was a topic that lacked oomph, was too simple, and didn’t test the limits of architecture – but I wanted to stick to my labor of love, and do the best I could with a perceived “boring” topic that meant the world to me. 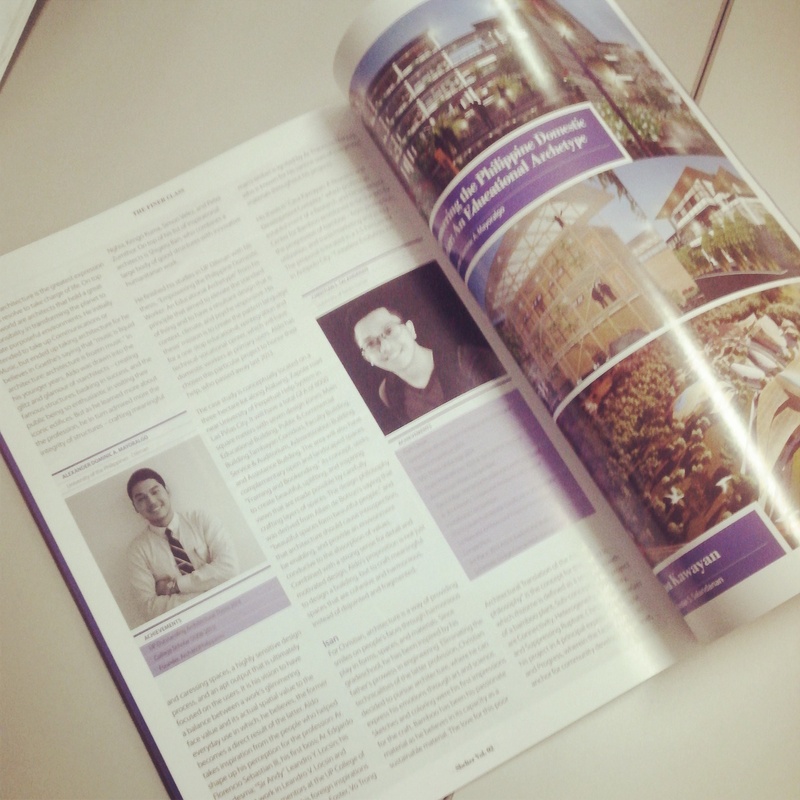 Needless to say, it remains to be the proudest work of my student life. A fitting bookend to solidify my motivations in life. All I really wanted to do with my thesis was to share the story of love my yayas and parents gave me, and make a testament to the silent heroes in our lives. To some extent, I’ve somehow achieved this with these small milestones – but I have ways and means to go – a lifetime’s worth to be exact. If there is one core message I’d like you to take home from this, it’s that you’re destined to strive towards great things – to find your own personal happiness and fulfillment – but also to make worthwhile the lives of those who sacrificed for you. What is at the core of your motivations? Call me cheesy, but mine is love. And I’m going to live my life trying to do a lot of good in this world. Stay motivated, stay passionate, and let’s help a lot of people. Please, feel free to comment below or send me an email if you’ve got something on your mind that you’d like to share. Cheers!